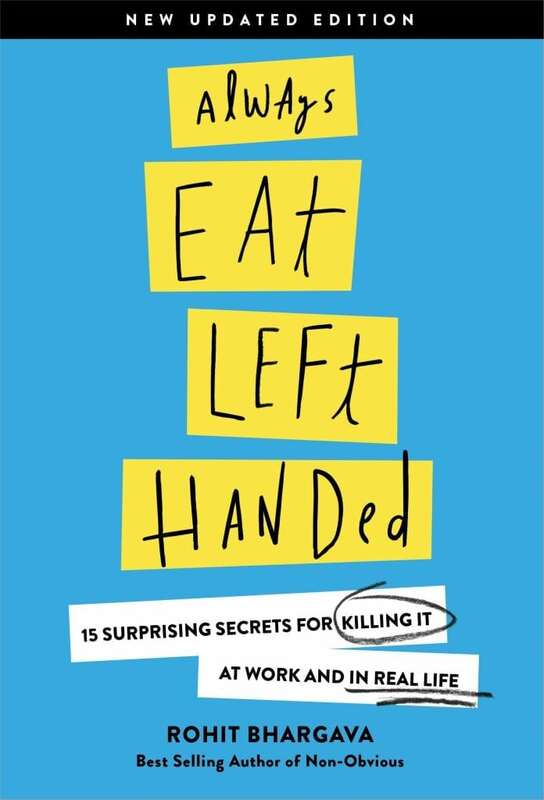 ALWAYS EAT LEFT HANDED IS THE “HELP-SELF” BOOK AND ULTIMATE GRADUATION GIFT FOR PEOPLE SURROUNDED BY WELL-INTENTIONED BUT USELESS ADVICE. In this entertainingly irreverent how-to guide, Wall Street Journal bestselling author, occasional Georgetown University professor, and award-winning storyteller Rohit Bhargava reveals refreshingly real, non-obvious advice for winning at work and in real life that no one has ever given you before. Reading just a few of the chapter titles, you might wonder if this book is serious. Indeed, it is. 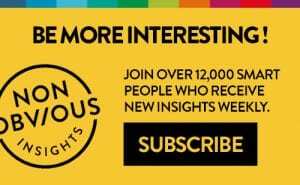 Through a bite-size collection of 15 quirky and insightful stories, you’ll easily learn what it takes to build your network, how to increase your charisma, why it pays to learn useless skills, and how to make your ideas go viral by helping others steal them. Always Eat Left-Handed’s accessible tone is akin to a brutally honest chat over coffee with your favorite real-world college professor who spends most of his time off campus and is often envied by parents (and even other professors) for refusing to sugarcoat the truth. It is a perfect graduation gift for your favorite grad from the Class of 2017! This isn’t a book about being left-handed. It is a book about seeing the world from another angle . . . the way left-handers are already accustomed to doing. Unlike which hand you prefer, this empowering book teaches you that the ability to shift your perspective isn’t something you’re born with. Instead, it comes from the tiny and intentional choices that you make every day. Bhargava’s signature non-obvious style shines in his personal and immediately actionable advice, crafted to make the transition to work and adulthood way less traumatic … and exceptionally more fun. Whether you see yourself as a Millennial or Centennial, a member of Generation Y or Z (or none of the above!) this book will offer an indispensable playbook for post-college success from an eventual entrepreneur who spent 15 years working in corporate America and Australia before leaving to start three successful businesses, write four bestselling books, and visit 35 countries as a professional speaker. For anyone sick of hearing they should do what they love, take more risks and make mistakes, Always Eat Left Handed is your desperately needed noise-canceling antidote. What if you could fast track your people smarts, become the team member every company dreams of having and build your work-world IQ by doing exactly the opposite of what most people tell you? You can! The first step is starting to eat left handed. The second is to read this no-nonsense book and use the secrets within to start killing it in school, at work, or in real life.